Some projects by Jamie Travers et al. This is something I looked into some time back which I have brought up to date and expanded a bit. My house has a heating setup which is fairly common in Ireland/UK – a central-heating boiler (gas) supplying the rads and the immersion tank, as well as an electric immersion heater. I think it’s clear that the gas is the best option for hot water when the heating is on, but what this attempts to answer is whether the electric immersion heater is cheaper to run for heating water only; i.e. during the summer months. The cost per kWh is lower for gas, but this doesn’t necessarily mean that gas is cheaper as you don’t achieve 100% efficiency in either case. Less so for gas as there are losses in the boiler itself as well as the pumping and pipework. Disregarding heating losses in the immersion tank, as these will be common to both energy sources, an electrical element will achieve close to 100%. Set the thermostatic valve on the heating loop of the central heating to the same temperature as the immersion heater thermostat. This was done with some trial and error – heating the tank with gas and comparing with the trip point of the electric stat. This left the set-point at around 70° for both systems. Heated the tank on gas for 1½ hours without any other gas appliance being used and monitored the consumption on the gas meter. Next day did the same for the immersion starting from cold again and with the same ambient temperature. In this case I had to turn everything else off at the fusebox – the immersion is on a separate MCB – so that the electricity meter would only show units consumed by the heater. Then checked the cost per unit (kWh) for each source – both supplied by Bord Gáis – and worked out the costs from there. The gas reading was complicated a bit by the fact that I do not have a bypass valve on the pump, so when the system is running there should always be a flow-path for the water to save putting too much pressure on the pump. This means normally leaving the smallest radiator on which obviously reduces efficiency. I ran a subsequent test with this rad off to get a reading for a similar system with a bypass valve – possibly at the expense of my pump’s life-expectancy. For both systems it takes about one hour to fully heat the tank, so it seems valid to compare cost vs. time. The results are shown in the graph below. Note that when I compiled this first about two years ago the immersion was the clear winner by about 25% – gas prices have come down since then, and obviously these results only apply to current prices (April 2011). The unit cost calculations are given in the footnote. So it’s clear that for my setup the immersion is the best choice as I need to leave a radiator on; even without the radiator the cost is the same at best. What is more generally interesting is whether there is a case for using the boiler in any scenario. My boiler is about 10 years old so not very efficient, but what would the results look like for a newer more efficient gas boiler, or an oil boiler? So these can be retrofitted into the previous graph to see how they fare. The unit cost has been recalculated to account for the higher price in the case of oil. Note that the costs associated with the boiler here should be minimal when compared with other installations: it is indoors (not the case for oil), the piping run is short (3m between boiler and immersion-tank), and it is a relatively low output boiler. Also, the electricity cost of running the boiler/pump has not been included – my boiler consumes 100W while firing, and the pump 65W at an intermediate flow setting. There is no oil boiler setup which can be run cheaper than the immersion for heating water. When left running for periods of 2h+ the immersion still beats a gas boiler. In the case of just heating a tank with a gas installation, the cheapest option will depend on the efficiency of the boiler: worse than around 80% will favour the immersion heater. Not having a bypass on the pump and having to open a radiator will possibly also rule out using the gas. Electricity units are expressed in kWh so cost calculation simply involves adding VAT @ 13.5%. For gas, the meter units are expressed in m³ so there is a conversion factor to kWh given on the bill: × 11.3911. The unit rate is 3.932 cent, but there is also a carbon tax levied per kWh of 0.277 cent. Finally VAT @ 13.5% is added. 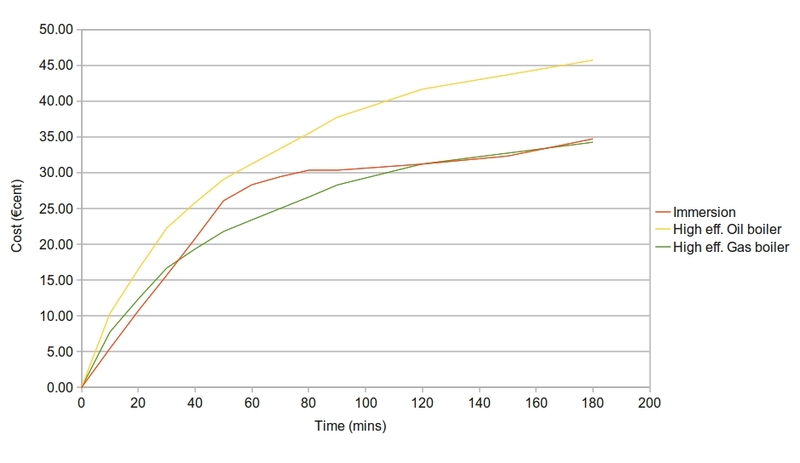 This is data for the first graph – electricity; gas with one radiator on for a return path; gas with hot-tank only. The second graph with high-efficiency gas and oil boilers represented is simply the gas with hot-tank values above with units adjusted in proportion to the boilers` relative efficiency. thanks, I just googled how much an immersion is to run, and I am glad I found your posting. I have always had a shower, but I am installing a full bath and it’s nice to see that it’s not gonna cost an arm and a leg to heat the water, also, I was worried because a friend swithed on my immersion last night and it was on for 24hrs, I can see from your graph that the last 23 hrs probably cost me 1euro, e work! Yep, should come in under €1 a day for an insulated tank once the water is already heated – not as high as most people think! That’s an interesting study – very helpful. I’m looking at installing a thermal store with wood burner and solar thermal inputs. My main decision is going to be what to use as the other heat source into the store – oil boiler, immersion, air source heat pump etc (no gas available). I would be interested in your thoughts. Also, in your experiment, what size were the tank and immersion. Thanks. I think this is something which requires detailed costing for your specific situation – the expected output of the solar panels, the duty of the wood burner, the local cost of heating-oil vs electricity, the intended use of the alternate heat source (hot-water/radiators) all come into play so there’s no generic solution. If, for example, the alternate source is simply a backup for hot-water only during the summer months then an immersion may make sense but you would have to run the figures unfortunately. The tank I took the measurements from is an 80 litre foam covered tank with a 2.85kW heater in it, by the way. Can I ask what temperature you raised the water to and what size is the tank? By looking at your data you seem to have a 2 kW immersion heater. Taking a 100 litre tank (which is pretty small) and raising the temperature by 55 C (raising 15 C to 70 C), it should take you approx 3.2 hrs. At today’s prices of 18.5 c/kWh you are looking at a cost of E 1.18. A good hot power shower (15 ltr/min) could use that up easily in about 20 minutes. Normal shower you might get 30 – 40 min. Hi Steve, you have a good point here. The immersion is rated at 2.85kW and from a rough calculation I think the tank holds 80l. Assuming that 50l of this capacity (short showers!) is heated by 55 C, I calculate that this should take 67mins which is in the ball-park. BUT, as you point out, the electricity units only indicate a power-consumption of around 2kW which should not be able to heat this amount of water in this time. As I said, the consumption is that measured directly by the ESB meter so maybe it’s being under reported and I’m getting cheap power! The energy costs are quite out of date by now anyway, so will have to re-visit this sometime with an independent electricity meter and new unit-costs. 1. There is no measure of the quantity of water heated. 2. There is no measure of the achieved temperature. The only measure of either is the statement “For both systems it takes about one hour to fully heat the tank”. The actual figure of electricity used in 1 hr of 1.77kw equates to 1522 KCal, which will only heat 27 l of water by 55C. 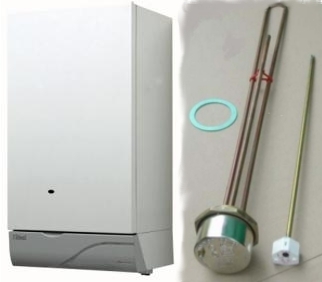 The Ideal boiler used has a minimum gas usage of 0.49l/s or 1.764 M3/hr. As it used only 0.512 M3 in the hour, it is only operating at 29% of capacity, and this than at only 76% efficiency! This shows that the heating coil in the hot tank is not good at transferring the heat to the water (not an unusual occurrence). Naturally, any system operating at minimum rate with other losses will be hugely inefficient. Its like measuring car fuel usage while it’s sitting in a traffic jam. I suggest you measure the amount of water heated and the temperature achieved. This could easily be done by running the water into a bath. Ray Lund said he replied. No sign of it ?